It seems that when Jean Dubuffet is mentioned, it's almost always in the context of Outsider art, a field that he helped definie and promote and that is currently enjoying a surge of interest. But Dubuffet was a major artist in his own right, and an exhibition at Acquavella Galleries aims to put the focus back on the man himself and his subversive creativity. "Jean Dubuffet: Anticultural Positions" (April 15 - June 10) is the first show of the artist's early paintings and sculptures--generally considered to be his best and most powerful--to be mounted in over 20 years (the last one was at the Hirshhorn in 1993). Curated by Mark Rosenthal of the Detroit Institute of the Arts, it combines works from Acquavella's holdings with loans from public and private collections, in the kind of museum-like presentation that is increasingly prevalent at high-end galleries in this country. The works on view date from 1943-59, the years of Dubuffet's boldest expeirmentation. Typical is L'adieu à la fenêtre (Farewell from the Window), from 1949, in which the figures and the surrounding landscape are scratched like graffiti into a monochrome layer of brown oil paint on burlap. The overall effect is deliberately childlike and cartoonish. In the early 1940s, with Europe in the throes of total war, it seemed to many that Western civilization was bankrupt and doomed. 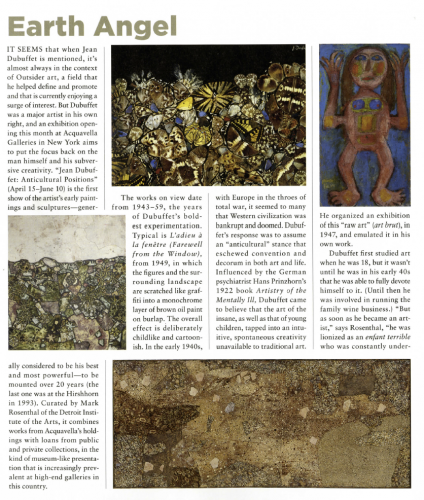 Dubuffet's response was to assume an "anticultural" stance that eschewed convention and decorum in both art and life. Influenced by the German psychiatrist Hanks Prinzhorn's 1922 book Artistry of the Mentally Ill, Dubuffet came to believe that the art of the insane, as well as that of young children, tapped into an intuitive, spontaneous creativity unavailable to traditional art. He organized an exhibition of this "raw art" (art brut) in 1947, and emulated it in his own work. Dubuffet first studied art when he was 18, but it wasn't until he was in his early 40s that he was able to fully devote himself to it. (Until then he was involved in running the family wine business.) "But as soon as he became an artist," says Rosenthal, "he was lionized as an enfant terrible who was constantly undermining traditions in portraiture, landscape, and abstraction." Dubuffet started using natural mateirals like gravel, cement, broken bottles, leaves, dust, and butterfly wings. "His pictures are lumpy with it, like volcanic slag," says Rosenthal. Noting that the Paleolithic cave paintings in Lascaux, in southern France, were discovered right around this time, Rosenthal describes Dubuffet's figures as a "a band of individuals who look like they just emerged from the earth. He's consumed with the subject of the earth." In the '50s, Dubuffet's work became less figurative, but even then, says Rosenthal, "the surfaces are made to look like earth, like you're looking at the ground." In this respect, Dubuffet had a huge influence on artists such as Georg Baselitz, Joseph Beuys, Anselm Kiefer, and Alberto Burri. "He was the one most responsible for introducing experimentation with materials," says Rosenthal. "It's long overdue for us to figure out who this fountainhead of art was."